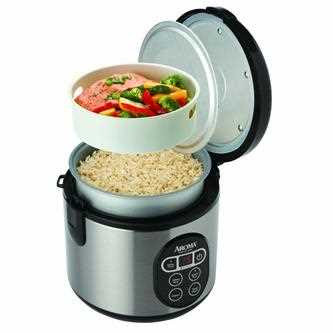 The Aroma rice cooker Cool-Touch is the perfect little aroma rice cooker and food steamer for anyone that is on a budget and looking for a good dependable cooker that can cook rice, soups, stews as well be able to steam veggies and meats at the same time. It comes in a 6 cup or 8 cup size and can prepare anywhere from 12- 16 cups of cooked rice at once. If never used a aroma rice cooker and food steamer rice cooker before but love this is the perfect cooker for you as it is so cheap it will make you wonder why you would even make rice the old fashion ever again. Otherwise keep reading if you want to read more about its features and specifications. Has the ability to cook stews and soups. It is an automatic one touch cooker so just prepare rice and press the button down and it will pop back up once the rice is done. For a low price entry cooker the Aroma Cool-touch rice cooker looks pretty nice. The flowery design doesn’t look too tacky and will fit with the decor of most homes. At the time of me writing this review the Aroma Cool touch Rice cooker has a pretty good rating of 4.1/5 on Amazon.com. Around 77% of the user feedback gave it either a 4 or 5 star rating. On plus side of the comments many users love the price and the convenience of the steam tray. On the negative end I have 2 major complaints. The first is the complaint of either burnt or under cooked rice and the second is the cooking button after a period of use will become loose and switch back up half way to warming mode. On the second this can because the rice to be under cooked as it won’t be producing enough heat part way through the cooking. This is a very cheap rice cooker, I won’t be giving you an exact price because sometimes it does go on sale but you will normally find it costing anywhere from $27 to $30. One positive note on the pricing though is compared to other rice cookers of the same price the Aroma Arc-1266f has plenty of people buying it and giving it a high rating so it is very dependable. If you are new aroma rice cooker review to cooking rice or just don’t eat rice often but don’t want the hassle of cooking rice the old fashion way then this is the perfect little cooker for you. It won’t have any of the fancy functions of the higher Japanese models rice like the Zojirushi but for what it does it does it very well which is to cook rice. As stated before if you are experiencing under cookware rice first make sure there is not a problem with the cooking button being loose and going back to automatic warming. If this is issue and your under warranty definitely have it looked at by Aroma. If it has been over a 1 year and out of warranty then one solution is just to monitor it more closely while it is cooking. This is actually an issue I have heard before of old rice cookers that has failing cooking switches. Fortunately to be a super big problem with the Aroma cool touch Rice Cooker. If this does bother you though than another solution is to upgrade to new model that uses a digital button on a LCD display. It will definitely cost a bit more though but you definitely get an upgrade in dependability. Note: Aroma now has a similar model called the Aroma ARC-838tc 8 cup rice cooker with an LCD display and the pricing is very similar as you can get it in the $30 range as well. We review it here at RiceCooker-review.com and found it to be very comparable to the cool touch!